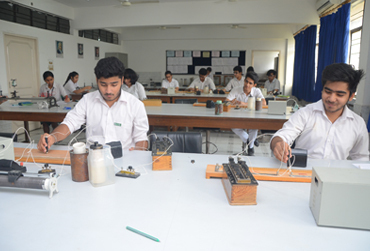 Physics lab, situated on the first floor of the school building, comprises of the main lab and a store room. The lab is very well lit and ventilation is excellent. One of the walls of the main lab is lined with approachable cabinets. The store room also has good capacity with cabinets, shelf tops and space for additional almirahs. The worktops provided to the students are wide and spacious. The tables are provided with in-built sockets for electrical connections of circuits. The lab has also been provided with water supply and drainage system. The apparatus in the lab is latest and able to cater for 25 students at a time. The lab has apparatus like electrical meters (ammeters, voltmeters, galvanometers, and multimeters), resistance boxes and coils, rheostats, battery eliminators etc to work with potentiometers and meter bridges. Optical experiments are carried out on optical benches with various lenses and mirrors. Prisms, glass slabs and mirror strips have been provided with drawing boards. Sonometers, resonance apparatus and viscosity apparatus help students to perform various experiments. Vernier callipers, screw gauges, spherometers, spring and physical balances, graves and apparatus are the other equipment present in the lab. Logic gate circuit and the pn junction’s apparatus help in electronics experiments. Apart from the equipment required for CBSE prescribed syllabus the lab also has telescope, spectrometer with both mercury lamp and sodium lamp. The lab is also equipped with an independent PC with printer to help students. Teaching in the lab takes place on the projector system with the help of various softwares.